Mika Hakkinen took pole position as usual in his McLaren-Mercedes MP4-14 while second place on the grid went to Heinz-Harald Frentzen's Jordan, a demonstration of the horsepower of the Mugen Honda V10 engine. This pushed the second McLaren driver David Coulthard back to third on the grid while Michael Schumacher's replacement at Ferrari, Mika Salo, qualified fourth, ahead of World Championship challenger Eddie Irvine. At the start of the race Hakkinen went away well but Frentzen and Coulthard were slower off the line and Salo was able to get through into second place. Irvine was sixth. Luck was on his side however as Rubens Barrichello's Stewart went out with a hydraulic failure and then Coulthard ran into the back of Salo and lost his front wing, forcing the McLaren to pit for repairs. This left Irvine to battle for third place with Frentzen. When the pit stops came Irvine managed to get ahead. There would be further good fortune for Irvine as Hakkinen's refuelling equipment malfunctioned and he lost a lot of time. This put Salo into the lead with Irvine second. Ferrari team management then decreed that the two cars should swap places although Salo sat behind Irvine for the rest of the race to show that it would have been his win. Hakkinen disappeared when a left rear tire on the McLaren exploded at about 200mph. The car spun wildly, narrowly missed hitting wall and then went through a sand trap into a tire barrier. Mika climbed out, shook his head and wandered off to the pits. 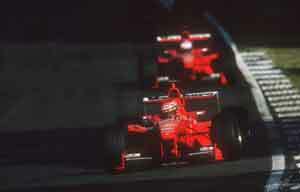 The Ferraris finished one-two with Irvine taking an eight-point lead in the World Championship while Frentzen came home third in the race and moved into third place in the World Championship ahead of Coulthard, who finished fifth. Ralf Schumacher again picked points in his Williams while the final point went to Olivier Panis's Prost-Peugeot.